Homeschooling your child in Cleveland? Let Scene75 help with a day of fun! Let’s start with the basic premise. Scene75 Cleveland is an entertainment center; with more than 120 arcade games, from Fruit Ninja to Crossy Roads to Skee-Ball, and numerous attractions including, but certainly not limited to, indoor go-karts, laser tag, blacklight mini-golf, bouncing, and mini-bowling, Scene75 Cleveland provides the perfect venue to host a ‘recess’ of sorts to free the mind and engage the senses in a wonderland of amusements. Homeschooling in Cleveland should be both educational and fun! Take a look at all of the attractions offered at Scene75 Cleveland. Competition is key to development. With one of the largest laser tag arenas in Cleveland, competition is only a laser beam away. 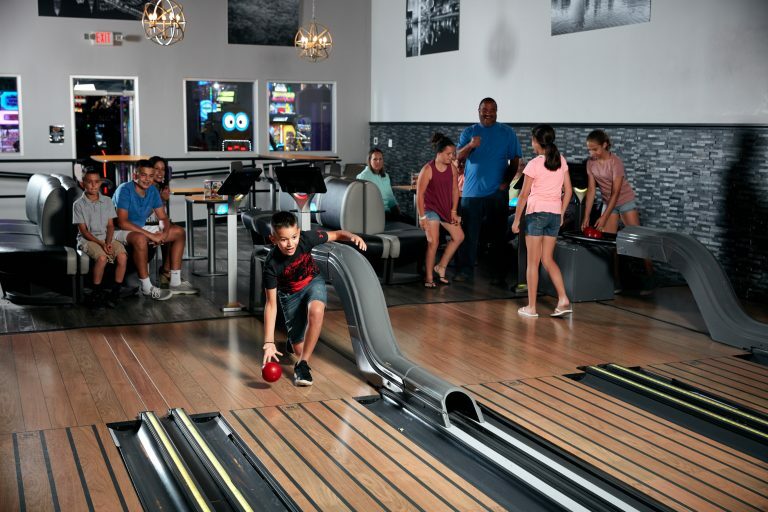 Compete against your child in a custom designed, two-story, blacklight laser tag arena; or if you come during one of the busier hours at Scene75, join forces and compete against an opposing team in a battle consisting of as many as 42 players at one time. 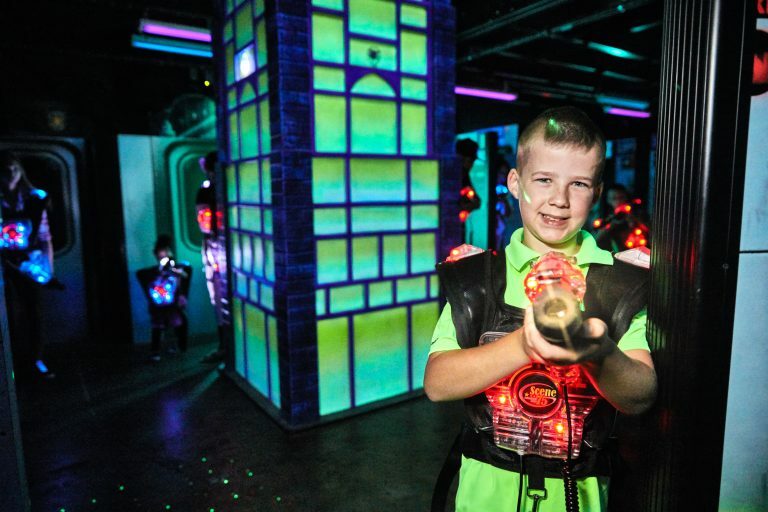 Laser tag also provides a great way to teach your child about physics – after all, it is the reflection of light combined with theatrical fog that provides the visual effect of the laser beam firing. There are many great websites available to help flush out a laser tag themed lesson plan, including this one, as well as many instructional videos to help explore laser tag in depth, such as this one. Bouncing is exercise in disguise. Scene75 Cleveland features an inflatable area with seven inflatables including an obstacle course, slides, and bounce houses. Each one is unique from one another and offers endless options for your child. If your child is a bit too small to play on the inflatables, there is also Toddler Town – an interactive city built for your youngest to explore and learn. On the wall of the city are more than a dozen puzzles, games and interactive play pieces. All of these activities are great ways to keep your child’s mind thinking and body moving! Who says learning and exercise can’t be fun? Scene75 Cleveland sure does not! You won’t have to travel far for lunch – but you sure can in your lesson plan! 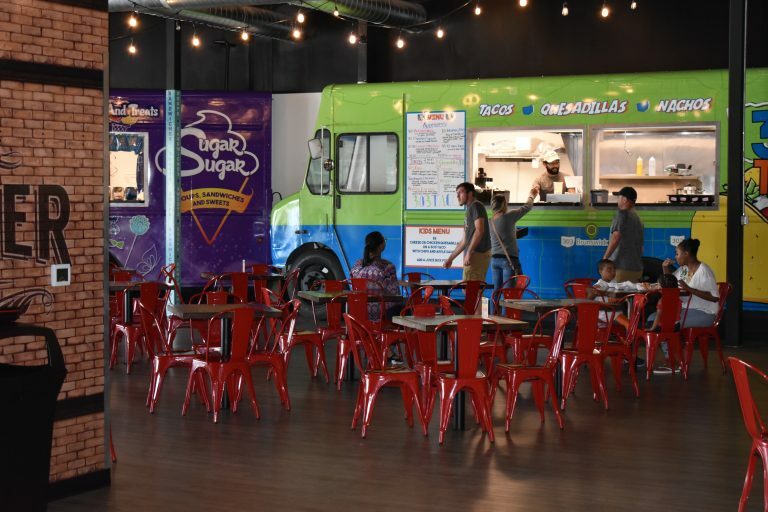 Located within Scene75 are four unique, permanently stationed food trucks that each feature cuisine from around the world; options include Italian, Mexican, traditional American, and well, let’s just call the fourth dessert heaven. After a fun, educational day at Scene75 Cleveland, you may just build up the appetite to enjoy a taste from all. Incorporate some lessons about each country or perhaps their traditional cuisine, and voila, you now have a great lesson plan to share with child! If you need some tips or facts to share about these countries, Ducksters is a great resource to prepare that lesson plan. Math is all around us so you may as well make it fun! Challenge your student to a game of bowling, but instead of keeping score electronically, give pencil and paper a try. Teach your student about addition, but allow his or her actions on the lane to determine the math problem! If you aren’t sure how to manually keep scores in bowling, learn within minutes. Make math come to life and you may just ignite or feed your child’s passion for numbers. Homeschooling in Cleveland has never been a more perfect strike!